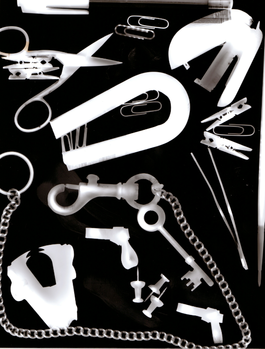 A photogram is made in the darkroom, without a camera. All this is required is print aper, a light source - i.e. the enlarger - and a selection of objects to place in the light path. Collect interesting shapes or use everyday objects, such as keys or coins. 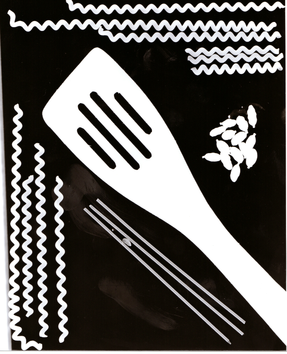 A photogram image is produced by arranging objects on the surface of a sheet of photographic paper. When the enlarger is switched on, the paper is exposed everywhere except in the shadow of the object. 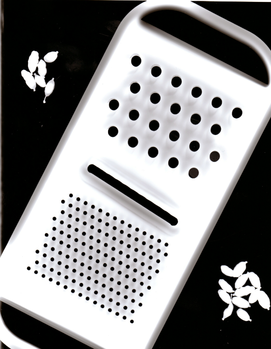 The paper then records a negative image - a silhouette in reverse - of the object. The principe is simple and some subtle and delicate effects can be achieved.